DART (Demonstration for Autonomous Rendezvous Technology) is a vehicle for demonstrating the autonomous mooring of two space vessels. 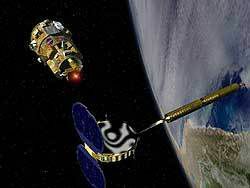 It was designed and developed for NASA by Orbital Sciences Corp. to demonstrate the ability of NASA to design autonomous systems and new technologies inherent to this kind of programme, for space rendezvous and also the assembly of components in orbit and all the other orbital services to be invented. It was the first demonstration programme selected by the NASA Exploration Systems Mission Directorate as part of the development of new technologies for the ambitious solar system and beyond exploration project defined by President Bush. The Bush administration saw DART, a programme launched in 2001, as the first stage in the realisation of its vision of space exploration of the Moon and Mars in which robotics would play an important role by considerably reducing very costly manned missions. Unfortunately the mission was a failure.